As winter progresses and the snow falls proper technique with shoveling can save your body from injury risk. While most of us cross our fingers for a light snow to melt quickly, as we know from “snowpacolypse” last year, those bigger dumps are coming at some point. Here are few tips on how to manage snow removal safely. Dress Warm: Cold weather makes your heart work harder to keep your body warm raising your heart rate and blood pressure. Dressing appropriately will ease the stress off your body to maintain core temperature while keeping frostbite/burn at bay. Get traction: winter increases the hazards of icy and slippery conditions. A fall may increase your injury risk or strain your back trying to maintain balance. Make sure you have good traction on your boots or use yaktrax to provide for good footing. Using sand, ice melt, or kitty litter can help to reduce slipping as well. Warm up (your muscles): A simple 5-10 min warmup can loosen your body’s flexibility and reduce risk of injury. Try stretching with specific focus on lower back, shoulders and legs or walking prior to shoveling. Use an ergonomic shovel: You’ve seen your neighbor using one of those weird handled shovels? Well, they work. The curved handle keeps the blade on the ground reducing forward bending stress to the back. Push vs Lift: if possible, push the snow vs lifting to reduce loading to the back. Biomechanics tells us strain increases on the back the further away the load is. 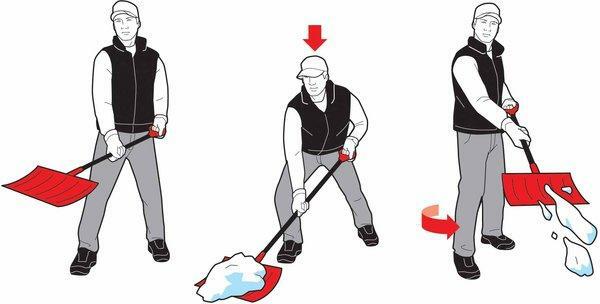 If you have to lift the snow keep the shovel closer to your body. Use your legs and bend at the knees and hips keeping your back straight (similar to a squat). Do not bend! If you must lift a heavier load, keep one hand on the handle and the other close to the load as possible. This will vary dependent on shovel type. Walk the snow to where you are depositing it versus throwing it. Keep the loads lighter within your ability to reduce loading. Shoveling snow before it settles will reduce the load as well. Wet and dense snow is heavier. Pace yourself: A little rest goes a long way. Try short breaks of 1-2 min to let your body recover. If you are feeling overworked or short of breath a longer break is indicated. Seek Alternatives: Get the kids to do it, vacation to Hawaii or beg your spouse it’s time to pull the trigger on a snowblower! Woo Hoo. Well, some of these might work. Enjoying Mirror Pond Pale Ale and waiting til June just might do the trick also. Good luck! If you have any questions or experience soreness with shoveling, please do not hesitate to call one of our Physical Therapists. We would be happy to help! Cheers.